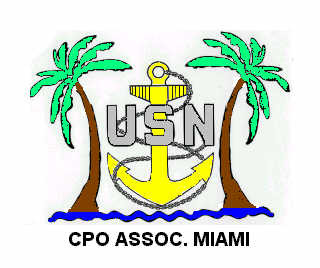 Chief Petty Officers Association of Miami, Inc.
Meeting called to order by Master Chief Robertson: 1932. Pledge of Allegiance, Sailor’s Creed and Moment of Silence. Minutes from the Previous Meeting. Motion to accept minutes as posted. Duly seconded and approved. Treasurer’s Report: Senior Chief Roy reported NO outstanding checks. Duly seconded and approved. Note that dues are payable now. Nascar check was received $4725.55. Spent $4740.00, $460 was donated from food and drinks. Nascar is a lost. $400.00 was the total made after ALL was paid back. Applications are due NLT 30 Jun 2019, make sure transcripts are included. August is the vote for the winner. Husband/wife of active duty member and children can apply. All info is on the website. Mark Hagger read letters send to us. Newyork Strike group, Mike Stevens- MCPON 13. Fleet Week Motion paid members only for the Chief’s Reception. If not paid by the April meeting then you cannot attend the reception. Fleet Week: meeting with Port Authority and Strikegroup2, and Navy Region SOUTHEAST. 5 ships; USS New York, USS Hue City, USS Farragut, LCS, SUB-TBD. 2 Coast Guard cutters, USS Mohawk another TBD. Fishing Trip 100 pp dive water cheaper for reef. 16 shirts at $20 each leftover from the season. $1600 was the cost, only $1425 recouped. Fundraising POC is transferring in six months. Nothing scheduled at this time. John Silva is having a hard time getting volunteers for fund raising a football events, will be serving food in the luxury box. Email will be sent. 01APR2019 Chief’s Bday. CPOA celebration in lieu of the meeting. Can still have the meeting, just a little before the party. VFW motion to have the Chief Ball or Bday Dinner; Motion to have 04 APR meeting a chief bday meal. $15.00 per person. JJ- is the lead, motion to celebrate the Chief’s Bday in conjunction with the meeting. What are we expecting? Total cost 80 people equals $2100.00 covered by the ticket sales. No extra expense, if you want to attend celebration uniform will be khakis or business casual. Who is selling tickets and number of attendees? NRD took the lead, they will sell tickets, all we do is buy tickets. Motion was made. Motion was also made to add extra $5.00 for tickets. Consider it a fundraiser for the CPOA. (motion carried) Nothing will happen JJ was not there to speak about it and received no support or feedback. Sea Cadets BLS reimbursement asking for $625.00 25 ppl X $25.00 American heart association Basic life support. Next meeting 04 APR 2019.